Linksys Dual-Band routers provide you with an option to set up your wireless network using either the 2.4 GHz or 5 GHz frequency bands or both. This article will provide you with instructions on how to manually setup the wireless network of your Linksys Dual-Band router. Alternatively, you can also change your wireless network’s name and password using the Linksys Connect Software. To learn how, click here. QUICK TIP: If you want to connect to a 5 GHz network, you should also check your laptop’s documentation if its wireless adapter is capable of connecting to a 5 GHz wireless network or not. If you want to know how to personalize and connect to the 5 GHz network on a Linksys Wireless-N router, click here. Access the router’s web-based setup page. For instructions on how to do this, click here. If you are using a Mac® computer to access the router’s web-based setup page, click here. Under the Basic Wireless Settings sub-tab, select Manual. For the E2000 or WRT320N router, select a Wireless Band and a Network Mode. NOTE: Select either the 2.4 GHz or 5 GHz band. If your router is not an E2000 or WRT320N, disregard this step and proceed to Step 5. NOTE: The wireless network modes for a Linksys Dual-Band router will vary depending on the frequency band(s) you choose to enable. In the 2.4 GHz frequency, the Wi-Fi signal range is divided into channels each at 5 MHz interval. Adjacent channels overlap and will interfere with each other at 20 MHz block. Setting the channel width to 40 MHz network will allow you to use 2/3 of the entire Wi-Fi band. Thus having a higher chance of overlapping and interfering with other wireless networks. Meanwhile, if you set the channel width to 20 MHz, the network will only overlap with the two channels before and after that frequency. For the Linksys Wi-Fi Routers, you may enable either the 2.4 GHz or 5 GHz band, or both by setting the Network Mode to your desired standard (i.e. Mixed, Wireless-N Only, etc.). NOTE: To disable a Wireless Band, select Disabled from the Network Mode drop-down list. Enter a Network Name (SSID). For Network Mode select Mixed or Wireless-N Only, then select Auto on the Channel Width option. NOTE: For Network Mode not set to Mixed or Wireless-N Only, the Channel Width is automatically set to 20 MHz only. QUICK TIP: If you live in an area where there is a lot of 2.4 GHz networks, avoid using the 40 MHz on 2.4 GHz to avoid interference. If you live in an area with less crowded networks, then you can use 40 MHz on 2.4 GHz to your advantage. Select a Wireless Channel from the drop-down list. 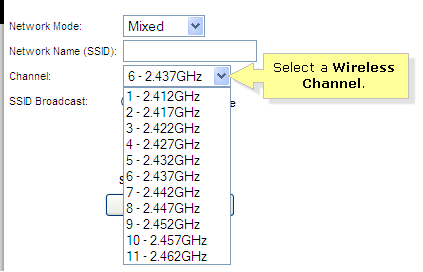 QUICK TIP: The recommended channels for the 2.4 GHz network are 1, 6, 9 and 11 since they are considered non-overlapping channels. For the 5 GHz network, channels 36, 40, 44 and 48 are recommended to less likely encounter interference. For the Linksys Wi-Fi Routers, it is best to leave the channel to Auto, if you are not experiencing any connectivity issues. Set the SSID Broadcast to Enabled to broadcast your 2.4 and 5 GHz networks. Then, click Save Settings to apply changes. NOTE: Setting the SSID Broadcast to Disabled will hide the wireless network.